Eds. Note: At bottom of this post, there are links to additional reviews. 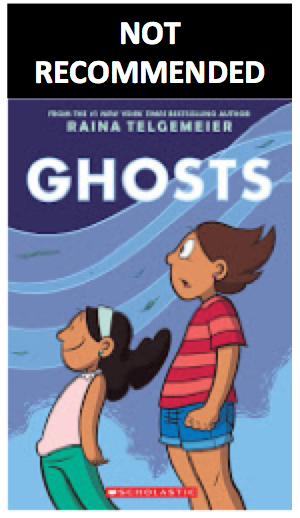 On Monday, September 19th, Raina Telgemeier will launch her new book, Ghosts, in Minneapolis. She's a much acclaimed writer with several best selling books. 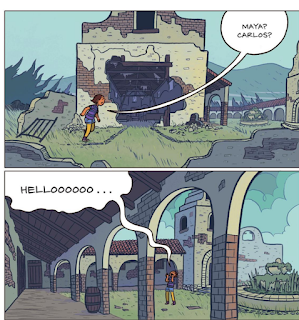 The ghosts in Bahía de la Luna (that is a fictional town) are primarily the ones they see at a mission. 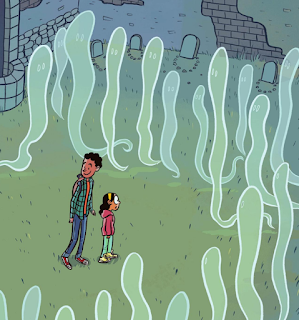 This starts on page 73, when Carlos (the neighbor boy who tells them about ghosts) takes them to the mission, "where the ghosts' world and ours mostly closely overlap." The three get separated on the way up there. Cat arrives, alone. The mission itself is run down. At first she's taken aback, but in the next panels, we see the ghost hug her, so she decides it is a friendly ghost. She says hi, but Carlos tells her that most of the people buried there were from Mexico, so, they like it when people speak Spanish to them. 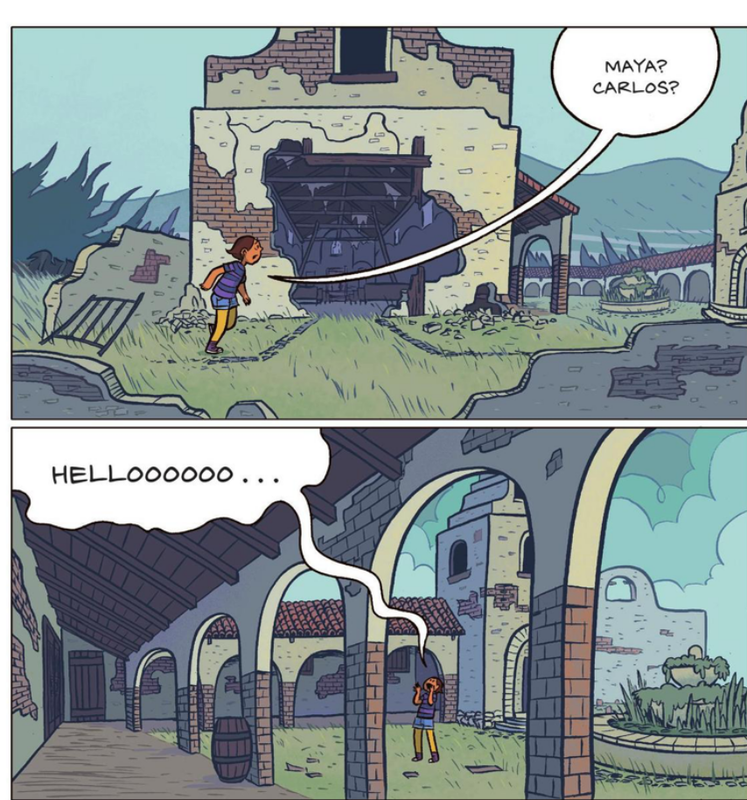 So, Maya calls out "Hola!" 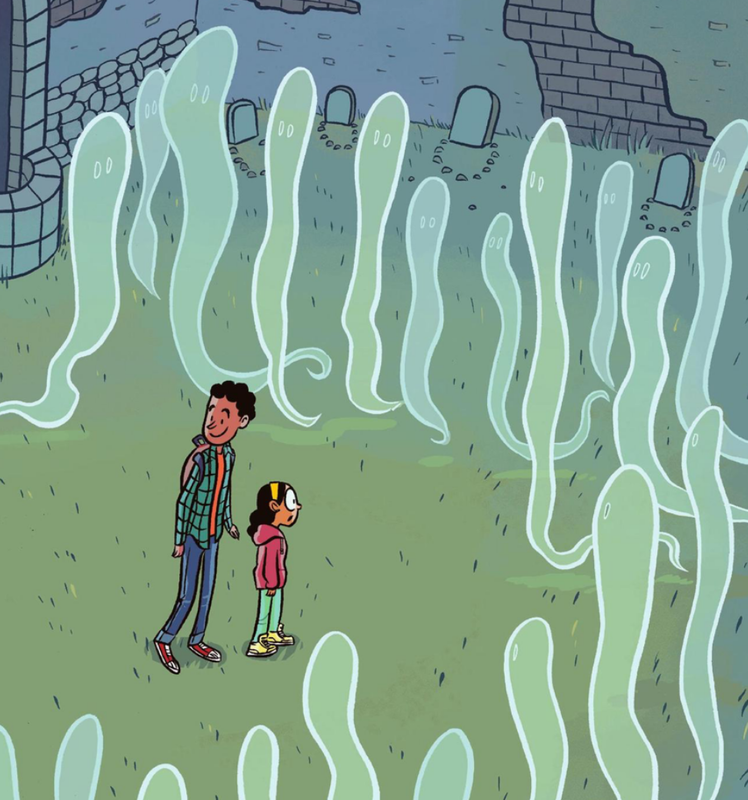 And I wonder, too, about those cemeteries. There are a lot of accounts that report that Native peoples were buried in mass, unmarked graves, elsewhere. 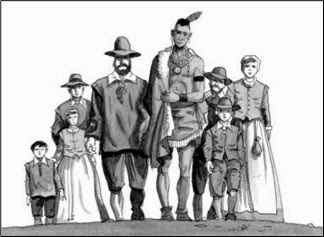 One might defend Telgemeier by saying that her ghosts are of the Spanish priests and maybe soldiers, and, maybe Native peoples who had been successfully Christianized, but the overwhelming evidence of the history is what I think should hold sway when we look at the missions, and when we give children stories about them. Wooden club used to strike quickly; alcaldes, soldiers, and sometimes padres carried these with them for spontaneous corrections throughout their day. The alcaldes used these during services in church to remind the Indians to be quiet, to pay attention, and to stay awake. A longer cudgel or cane was useful during Mass because the alcalde could reach far into a crowd without having to move very much. Look, too, at A Cross of Thorns: The Enslavement of California's Indians by the Spanish Missions by Elias Castillo. He writes about treatment of Native people who tried to escape the missions. When caught, the friars at Mission San Francisco burned crosses into the faces of men, women, and children. If you can't get Bad Indians or A Cross of Thorns right away, then read The Lesser-Told Story of the California Missions, which includes quotes from their books. Until now, the true and full history of the California missions has never been told. When visitors tour the missions, they are usually presented with stories and images of peaceful, loving priests and soldiers who treated the Indians as adored children. These stories belie the truth of the missions, where Native Americans suffered under harsh and brutal conditions. As a young boy, I listened to stories from my elders about the cruelty of the missions. There were tales of how native women were captured— with their thumbs tied together with leather straps to form human chains— and marched forcibly from their tribal lands to the missions. If the Indians did not cooperate, the soldiers, at times, killed them. In one incident, more than two hundred women and children of the Orestimba tribe (living near what is now the town of Newman) were being taken to Mission San Juan Bautista. When, after passing the summit at the Orestimba Narrows, these women refused to go any farther, the Spanish commander ordered the women and children killed with sabers and their remains scattered. The oral traditions of our tribal band, the Amah Mutsun, taught us stories of how certain Spaniards would appear when the Indians were first brought into the missions so they could get their pick of the young girls and boys for their perverted appetites, always with the tacit approval of the priests. I know most people don't want to read about such things, but for certain, we cannot go forward presenting the missions as Telgemeier does. Can you imagine what Mr. Lopez's response to Ghosts? Can you imagine how teachers will use this book in the classrooms? On a superficial level, it looks to be the perfect "diverse" book. It isn't. 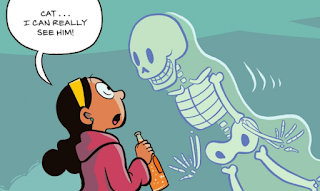 Head over to Reading While White's post about Ghosts and see the conversation and links there. In particular see what Yuji Morales and Patricia Encisco submitted in their comments about the book. 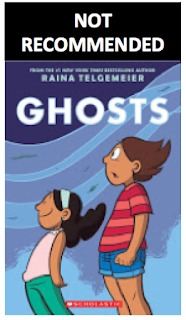 Published in 2016 by Scholastic, I do not recommend Raina Telgemeier's Ghosts. Eds. Note: AICL will add links to additional reviews about concerns with the book. Mary Pope Osborne's Shadow of the Shark was published in 2015 as part of the best-selling Magic Tree House series. Osborne's Thanksgiving on Thursday did not fare well, here, at American Indians in Children's literature. Her Shadow of the Shark is just as bad. I tweeted as I read it, on September 15, 2016, made the tweets into a Storify (inserting comments between the tweets), and used the copy/paste function to paste the Storify here. Geez. 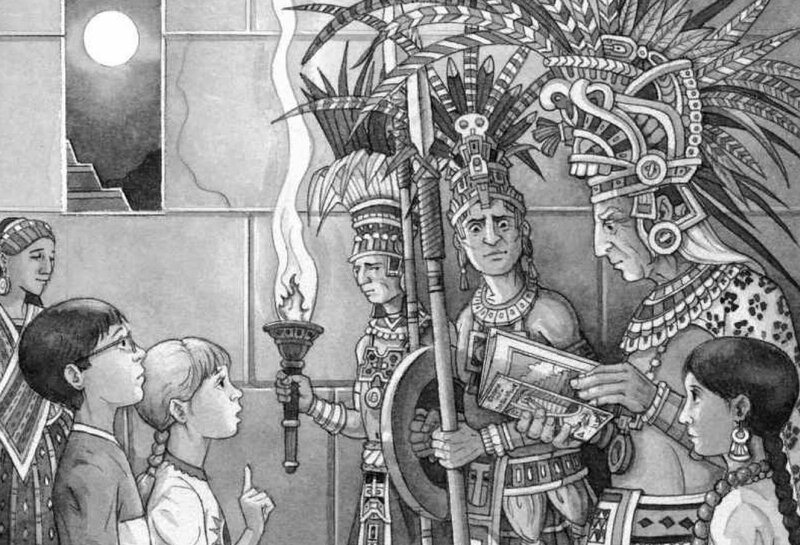 In Osborne's SHADOW OF THE SHARK, Mayan king decides white time traveler boy will be the next king. That's why the Mayans were looking at Jack (white boy), with fear and wonder when he and his sister walked into the midst of their dance. 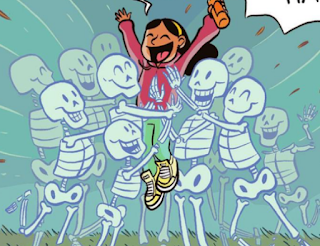 Oh dang... and not surprised... Mayan girl using "many moons" phrase. Her name? Heart-of-the-Wind. Her name... doesn't it call to mind Disney's Pocahontas?! She moves "silently and smoothly" through the swamp. Jack is noisy but wants to be like her. These goofy hyphenated Indian-sounding names (oh dang, I used a hyphen, too) are dreadful. So many writers come up with names like these for characters. But heck. A little research, please! Osborne could have looked for someone who speaks one of the Mayan languages, and found out what their word is for jaguar, and used that, right? Or a translation of it, from that language into English? Maybe Osborne thinks there's no Mayan people around? Surely, though.... doesn't she listen to, or read, national news? Like this story? Enlarge this image On a weekday morning, in an upscale area of Arlington, Va., the suburban silence is as thick as the foliage save for the hum of a leaf blower or an occasional car. In one of the homes, Sheba Velasco is thinking of snacks for the children. ... to "send peaceful thoughts" and then he lets them pass. SHADOW OF THE SHARK came out last year, by the way. It is a Magic Tree House bk. Did you catch that... Heart-of-the-Wind/Pocahontas... talking to animals? Who edited this book? It is so White. Jack's sister, Annie, looks at Heart-of-the-Wind and says she's like an Eagle Scout. In an underground place, Heart points to columns of white rock and says they're stone sculptures made by "the Rain God." But Jack remembers his geology studies. Those things are stalactites. He likes Heart's explanation. How nice of him. I wonder if Osborne has a Magic Tree House story where Jack and Annie travel to... the Vatican. I wonder if that book would be dismissive of what they see there? Heart leads them back to the beach where they started their time travel. As they say bye, Heart says she'll tell her King-dad they left. With Jack and Annie leaving, Jack won't be the next king who will lead the Mayan people. JACK tells him that Heart should be leader... he'll listen. But Jack can't go back to the place where Heart's dad is, so... they record a video on Jack's phone. Heart will play this magic for her dad! “Greetings, Great Sun of Palenque. I have a message for you. My sister and I have come from Frog Creek, a land far away, to tell you this:"
"women can lead just as well as men. Many women are leaders in our world. They are presidents, queens, senators..."
It goes on... They play it back for Heart, who is amazed. Her gift in return is some magic that helps them return to the present day. & was first female Mayan ruler in Mayan history "due to extremely unusual circumstances, the details of which have not survived." Yay (not) for White Saviors! And White Writers! Osborne's other books with Native people include THANKSGIVING ON THURSDAY. A friend (you, Diana!) asked (on Facebook) for books that a first grader could read on Kindle. Several people suggested Mary Pope Osborne's Magic Treehouse Series. I chimed in to let Diana know that Osborne's Thanksgiving on Thursday is one that I do not recommend. Here's why. There's a review of BUFFALO BEFORE BREAKFAST in A BROKEN FLUTE: THE NATIVE EXPERIENCE IN BOOKS FOR CHILDREN. No surprise... it is a #Fail, too! Guess what the wise old Lakota grandma in Buffalo Before Breakfast names Jack? Rides-Like-Wind (I guess Osborne is partial to names with wind in them). I know some of you think I'm mean, being snarky and all towards Osborne's writing. Some of you may even think what I've said should be ignored. Because... tone. Some of you think that criticism has to be delivered in the proper way. Sometimes, snark is the only way to get through a book. I hope Osborne reads this Storify. I hope her editor does. Reading Shadow of the Shark is one of those many times when I read a book and think HOW DID THIS GET PUBLISHED?? ?